Shareholders will have despaired at the performance of both firms in the past year, but there are grounds for backing Credit Suisse over Deutsche Bank in the coming 12 months. Both stocks’ total shareholder returns are down over 50 percent since they changed leadership on July 1 last year, according to Reuters Eikon. Yet the geographic and business mix suggests Credit Suisse boss Tidjane Thiam has a better chance of restoring value. Deutsche boss John Cryan has grounds to feel aggrieved. Though only co-chief executive alongside Juergen Fitschen until May this year, Cryan has made the most of a lousy hand. Offering to buy back Deutsche’s senior unsecured debt in February regained some market confidence. Cost cuts announced in October may have been unambitious, but were realistic in view of rising IT and regulatory expenses. Thiam, by contrast, has had several missteps. He needed two attempts to restructure Credit Suisse’s investment bank after conceding he was unaware of the scale of certain lossmaking trading positions. Comments about the greed of some investment bankers may have also hurt a franchise that accounted for almost a third of group revenue in the first quarter. Credit Suisse has better prospects, nonetheless. Europe, the Middle East and Africa accounted for just 16 percent of revenue last year versus almost two thirds at Deutsche. Cryan’s bank, therefore, is more exposed to the knock-on effects of the UK’s referendum vote to quit the European Union. And barring a significant currency devaluation in China, Thiam’s decision to put growth in the Asia-Pacific region at the centre of his strategy should begin to pay off. There is more to like about Credit Suisse’s strength in wealth management, in spite of the low-rate environment depressing returns. To some extent, that is priced in. 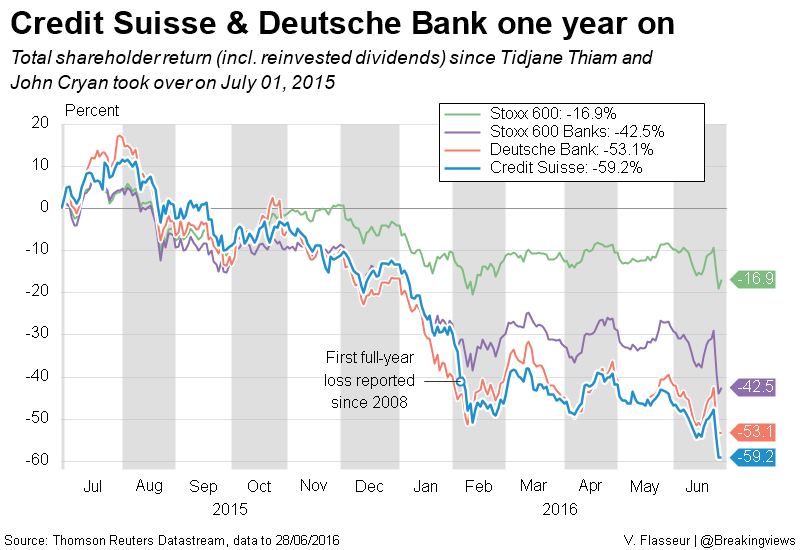 Deutsche trades at a 70 percent discount to its estimated book value over the next 12 months. At Credit Suisse, the gap is just a half. One factor is Deutsche’s propensity to attract big regulatory fines. Cryan’s decision to ditch businesses posing outsized compliance risks is a bid to fix that, despite a hit to revenue. Still, it is hard to look beyond the dour outlook for Deutsche. It may be tough on Cryan, but Thiam and Credit Suisse seem to have the edge. Shares in Credit Suisse and Deutsche Bank have fallen more than a half since the two banks assumed new leadership on July 1 last year. The total shareholder return for Credit Suisse was down 52.6 percent as of the end of the June 24, Reuters Eikon data shows, while the total return for Deutsche Bank was off 50.5 percent. 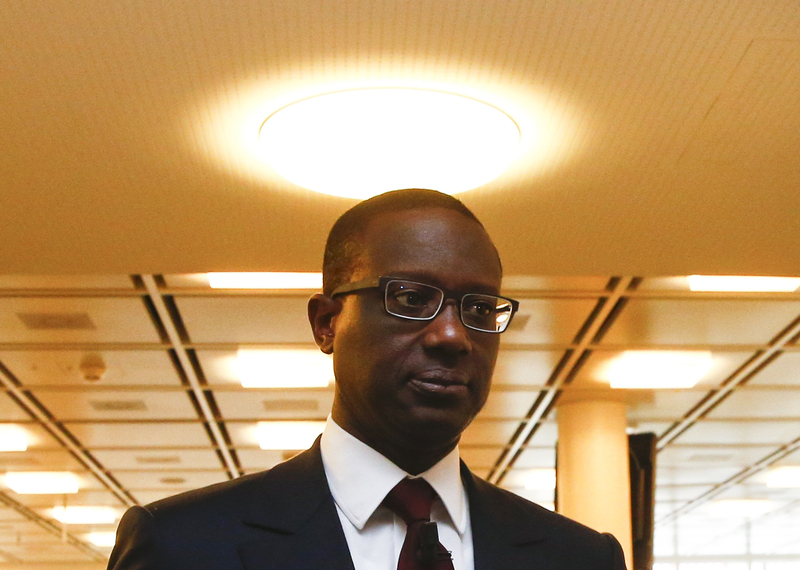 Tidjane Thiam became Credit Suisse's chief executive on July 1, 2015. John Cryan became co-chief executive of Deutsche Bank on the same date, and become sole CEO in May this year.